At the IFA 2015 conference in Berlin, Intel's General Manager Kirk Skagen revealed that the fabled chipmaker is testing its sixth-generation Core family chips (based on the Skylake architecture) in smartphones. The promising bit of news comes related to the official launch of Intel's 6th-gen Core family, which encompasses Core M, i3, i5, and i7 chips. 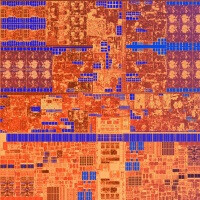 Unfortunately, Intel did not reveal details about smartphone-ready Core M chips. Theoretically, they could enable processing power comparable to lower range Core M laptops and hybrid devices, but this doesn't mean your Android smartphone will become an Android laptop replacement. First off, Intel is optimizing its silicon for Windows 10, which means those Core chips are targeting Windows smartphones and tablets. And second, the scalability of Intel processors is proportional to their power draw. See, Intel has no problems fitting a chip inside a device as small as the Compute Stick, but a battery-powered smartphone presents a different challenge. Battery and cooling technology doesn't seem to be catching up as fast as processing and memory tech, which means integrating a powerful CPU into a phone is tied to liberal amounts of clock speed throttling. However, let's not be too quick to burst anyone's bubble with so little information available. The main takeaway here is that true desktop-class processing power may become available in mobile devices in the non-too distant future. Thanks, Intel! Surface phone with full Win10? My dream exactly! Windows phone with Intel inside... Hope to be soon as October 19-th... ... Can i ask you guys and girls, only me is that facing problems with this site? Slow loading, lots of ads... I tried on Android galaxy tab 2, on my desktop PC with windows 10, both with ms edge and chrome, also on iPad mini... Everywhere same result - slow loading, sometimes closing the browser etc. Try ad block in Chrome. On my SGS5 PA site works well, but its often reloading it when I am opening link in new window and returning back. It's my dream too. I want also option to put this phone to bigger screen tablet. Something like Asus did. I disabled adblock on phonearena 2 monthes ago, but they made me to turn it on again. the site becomes laggy even on a high end laptop, JESUS! Use hostman, works across your entire os and not just a single browser. Actually we already have it. Windows 10 is universal. One platform runs on many devices...also the apps..they adapt to the device you run them on. Nope. Smarthphones use different processor type ARM. With Windows 10 you get possibility to create uniwersall apps. Old apps designed for normal Windows works only with x86 processors. Yes that is why he said apps, not programs designed for last years windows. If you are designing a windows 10 app, 9/10 you will make it universal by default. Yes, but you need to look on current WP apps like facebook or instagram. I don't have WP, but I heard that these apps are a joke compared to iOS or Android versions. Lets hope it will change with Win10. Also I want full Win10 to connect my phone to station or tablet (like Asus) and play games like Heroes 3. Well, if you can have the processor in your phone, one that is just as fast as a laptop processor, but with the same low power usage as ARM processors? why wouldn't you? you could an insane power boost? much more dynamic and possibly less power consumption? WTF dude?! This is a tech site, take your political s**t to fox news. Even if it works fine, it alone will cost as a high end smartphone considering Intel's pricing. I am all for smartphones eventually replacing your laptop and desktop for serious work. Less products to shop for. It just projecting the phone screen, WP8 can also do it. Windows 10 with Continuum It's a whole different level. I read the source article no mention of Core M in phones. Broxton is coming and based on goldmont but that was not in the article. Core m in smartphone will be excellent...but is there any core m soc with integrated modem, isp, gps, wifi and bluetooth, gyro etc? And then there is price...it's $281 for m3 & m5. Price alone makes this core m not feasible for mobile phone oem.